Happy almost 2014! I am wishing everyone well ahead of time because lord only knows what kind of state we'll be in on January 1st. Every year pre-Little Man, this would've meant that we'd be too busy sleeping in and reminiscing about the fantastic dinner and treats late into the night but this year, it means we may or may not be knee deep in paper towels and the constant refrain of, "Tell Mamma or Babba when you have to go, okay?" See, the Hubster and I thought this week off of work between Christmas and New Year's Day would be the perfect time to potty train Little Man. 'Cause we're smart like that. We optimistically embarked on an intensive three-day plan. I won't get in to the gory details, this being a food blog and all, but suffice it to say, we're finishing off Day 3 and there's no end in sight. Little Man is holding his own and in this war of attrition, we're clearly on the losing end. The Hubster and I have eaten more M&Ms than Little Man from the reward jar and it's entirely possible that come New Year's Eve, we will still be engaged in the same, messy standoff. Luckily, we were smart enough to factor this little project in when making our New Year's Eve plans. Which is to say we didn't make any grand plans at all. We turned down the invite from a friend and his band playing at a too cool for school hipster bar downtown. We also politely declined the potluck soiree with our can't-believe-we're-all-parent friends. Oh, and we were a firm no on the Evite for the progressive dinner party organized by our neighbor (though I am a bit bummed to be missing the bunco). I think my exact reaction was, "You want me to pick up the millions of toys littering our house for one course?" Instead, we'll be hanging out in our jammies. Not our best pairs, mind you. We're well aware that we'll be involved in lots of cleanup. The party will start somewhere around 4 p.m. when everyone's patience is a bit worn and spirits are running low. I'll be serving a snappy mix of orange juice and sparkling water in plastic flutes to the cleanup crew (also known as me and the Hubster) and plenty of juice boxes to the younger guests. No wait, just one, very important, mini tyrant of a guest. And I'll make a bunch of little bites for us to grab on the go because there's no sitting down on this job. I know for sure that I'll be making these Spinach and Caramelized Onion Canapés. Perfectly cheesy little bites, filled with creamy spinach and caramelized onions. 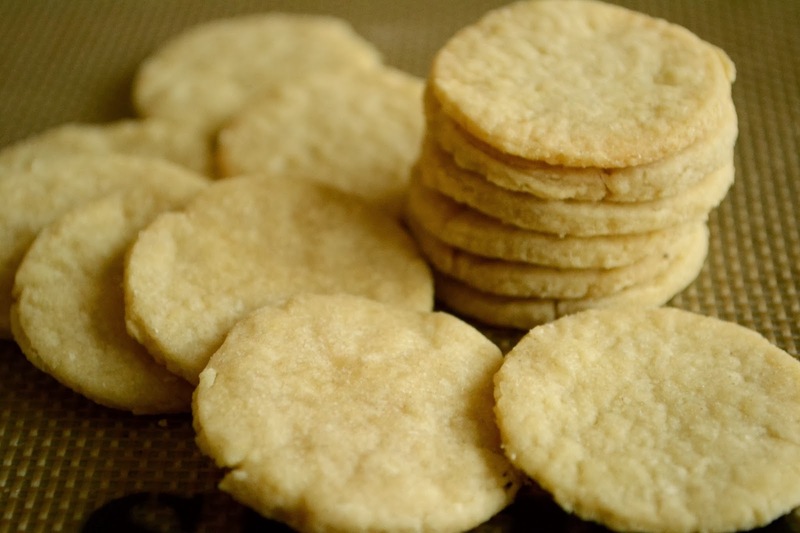 I plan to serve them on little homemade buttery crackers but given our predicament, homemade crackers might turn into Ritz. They really are a great bite for any soirée. Make them ahead of time, go curl your hair, top 'em with a bit of parmesan and broil them right before your snazzy guests ring your doorbell and you have the perfect fuel for your New Year's Eve of revelry. Or in our case, a late afternoon of coaxing, cheering, and cleanup. Happy early 2014, y'all! Have a great New Year's Eve, take lots of silly pictures, be safe, and most importantly, tell Mamma or Babba if you have to go! Heat large pot with about 2 teaspoons of oil. When oil is hot, add onions and cook on low and slow heat until caramelized. In the meantime, in a separate pot, heat 1 teaspoon of oil, and cook garlic until golden. Add spinach and cook on low heat until spinach is wilted. Allow both caramelized onions and cooked spinach to cool. In a mixing bowl, mix cream cheese, caramelized onions, spinach, and shaved cheese blend (I'm partial to the parmesan, romano, and pecorino blend sold at Trader's Joe's but feel free to shave up your own blend if you have a well stocked cheese drawer). Season with salt and pepper. Dollop a 1 tablespoon serving of the cheesy spinach mixture on homemade butter crackers made using a 1 1/2 inch circular cookie cutter and the dough from this recipe for 5 minute pot pie crust. Top with a thin sliver of parmesan and broil for 2-3 minutes until cheese melts and forms a golden crust. You had me laughing during this entire post...I remember the potty training days! I remember the M and M's! The good news is that eventually they do catch on and then it's smooth sailing. If it's any consolation, we will be in our pajamas (not our best either) on New Year's Eve. I have zero interest in freezing outside until the stroke of midnight. I'm old, what can I say? Oh yaay for potty training. It does feel like the losing end but one day soon, he will want to go on the potty all on his own- just like that. It just takes one time for it to click. P.S: There will be a million accidents after that too. My husband would love these, and by love I mean really really really love. Happy New Year! These look fantastic! I looove spinach. It's one of my favorite foods - and I am a HUGE fan of appetizers, so this is definitely now in the rotation. Pinning! Happy (almost) 2014! Good luck with the potty training (can't offer any advice on that one), but that canape looks absolutely delicious. Happy New Year my friend. I'm sure it will be over soon and you will be so glad to be free of diaper even if it's only for a few months. I spent NYE in my jammies. I'll bring the raspberry syrup whenever you are ready. Looks like a wonderful appetizer. I wish I had some of these last night. Happy New Year! HAPPY NEW YEAR SWEET GIRLFRIEND!!! Cheers to a great 2014. This post brought back memories and made me smile. It will all be fine. These look delicious! Caramelized onions are my favorite. And Happy New Year! Glad you got to ring it in with your boys! 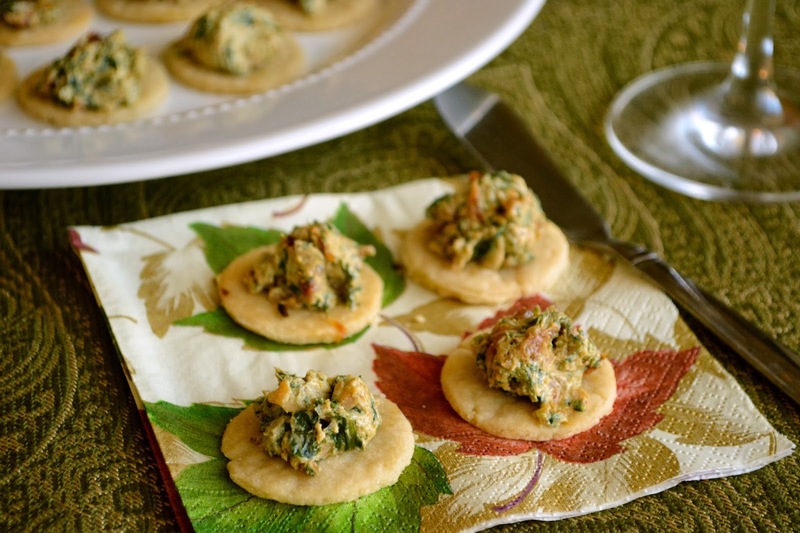 The spinach, onion and cheese combo is just too delish - putting it on a butter cracker - BRIALLIANT! Happy New Year! Except for the potty training you know how to have a laid back holiday.These canapés rock too. 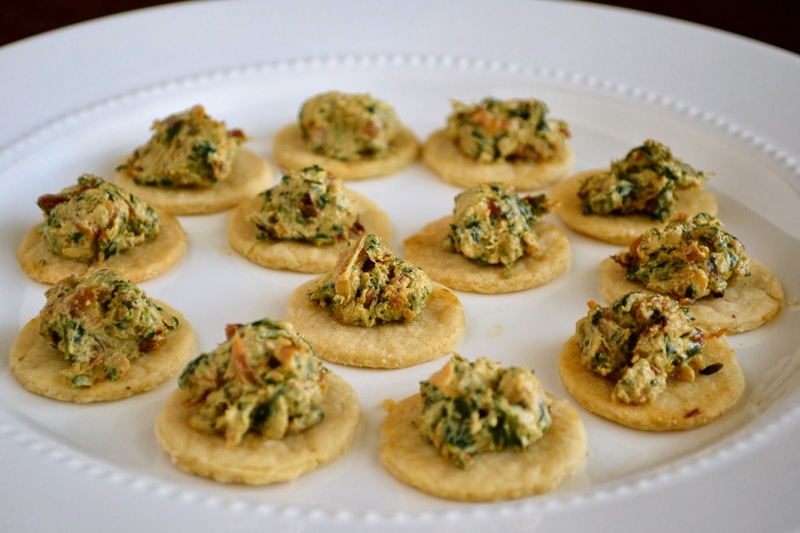 These sound like great appetizers, love the spinach, onion and cheese combo! Good luck with the potty training, I am planning to start training our 2 year old too sometime this week or next too - eeks! Happy New Year! Eeekk to potty training. I remember with my sister it was a disaster. I mean, she eventually figured it out...but on her own time. At least you had canapes! YUM. Your posts always make me laugh, although I feel like I shouldn't when I think of your struggles with potty training! I hope the first days of this new year have turned out better on that front :) I would serve these amazing canapes at any party! Happy New Year to you and your family, Azmina!